Fun yellow coloured M&M sweet hair grips. This item makes a great gift for M&M lovers everywhere. 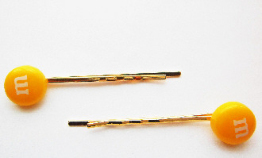 These hair grips are 10mm and secured to a gold plated hair grips.